Liquid films on cylindrical bodies like wires or fibres disintegrate if their length exceeds a critical size (Plateau-Rayleigh instability). Stabilization can be achieved by an axial oscillation of the solid core provided that a suitable combination of forcing amplitude and frequency is given. 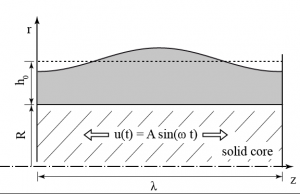 Problem definition: Liquid layer of unpertubed film thickness h0 subject to a solid core of radius R. The solid core oscillates with an amplitude A and a angular frequency ω). To investigate the stabilizing effect, direct numerical simulations (DNS) of the axisymmetric problem are conducted with a height function based solver. 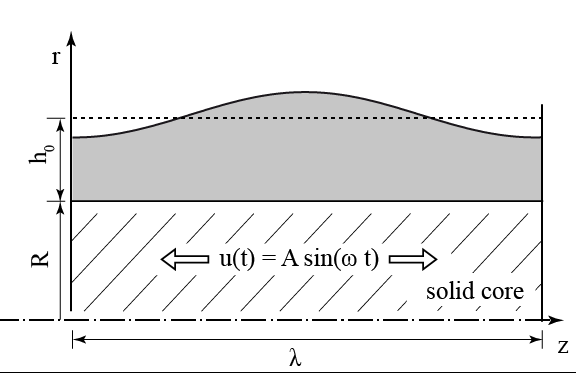 It is found by comparing the velocity field in the fixed coordinate system (see first video below) and the moving frame of reference (see second video below) that the mechanism of film stabilization is caused by the interaction between an inertia dominated region (high film thickness) and a viscosity dominated region (low film thickness). Replenishing of the thin film region is thereby supported while depleting is suppressed, finally leading to a stable film flow on an oscillating cylinder. Film topology during one period of excitation. Color-coded space-time plot.